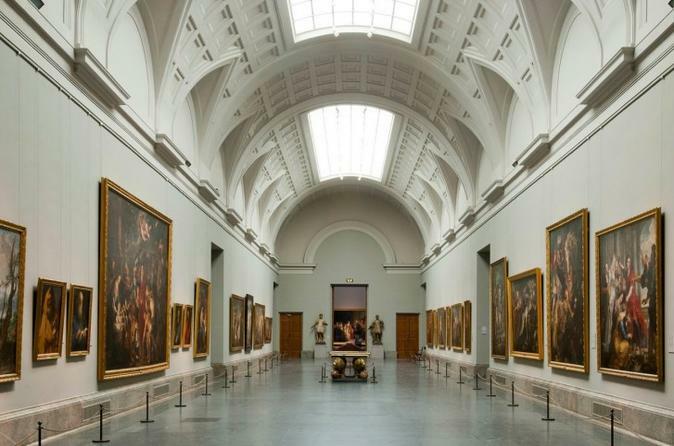 Make the most of your time in Madrid with a 7-hour tour to the best art museums Spain has to offer: Prado Museum, Reina Sofia Museum, and the Thyssen Museum, referred to collectively as the Golden Triangle of Art. With the guidance of an art historian, see from a short distance such masterpieces as the 'Las Meninas,' 'El Jardín de las Delicias,' 'El Guernica,' and 'Les Vessenots.' Tour size is limited to a group of 30 plus your guide. Meet your guide next to the Velazquez Statue outside the Prado Museum for your tour to begin promptly at 9:45am. Enjoy three fabulous museums and learn all the secrets behind their works with the explanation of an art historian guide. Your guide will lead you through all three museums and give narration in both English and Spanish. At Prado, enjoy two hours to explore one of the world's finest collections of European art, dating from the 12th century to the early 20th century, based on the former Spanish Royal Collection. See the Italian primitives and works from the English, Dutch and German schools. Learn about the museum’s history as you walk through the galleries and admire the artwork. At Madrid’s Reina Sofía Museum, spend approximately 1.5 hours discovering the work from some of Spain’s finest 20th-century artists, including Pablo Picasso, Salvador Dalí, and Joan Miro. See the works of Impressionists and Expressionists, as well as European and American paintings from the modern period. Today, Reina Sofía Museum holds a large number of works and is one of the world's largest collections of modern and contemporary art. Explore the hallways and galleries with your guide, and learn how and why these talented people created their art. Take a break of approximately one hour for lunch (own expense) before continuing the tour at the Thyssen Museum. Meet your tour guide at 3:15pm at the Thyssen Museum. The Thyssen-Bornemisza fills the historical gaps in its counterparts' collections. Where the Prado features the early schools and the Reina Sofia showcases work from the modern period, the Thyssen provides a comprehensive overview of schools from the Renaissance to Pop Art. In contrast, the museum also boasts numerous portraits and landscapes. Tour will end at approximately at 5pm at the Thyssen Museum. Special Offer - Book by November 2 to save 10% off our previously offered price! - Book Now!